The company provides a wide range of services that covers all aspects of advice for new golf course developments , existing course renovation or improvements, planning applications, master planning and expert witness consultation. feasibility studies ( if required) assessing viability, costs market etc. 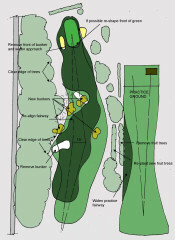 we are often asked to advise and prepare golf course layout plans for housing / hotel developments. These are usually large scale developments where close liaison is required between all consultants to realise the greatest advantage from a site. Expert witness – Simon Gidman has acted as an expert witness on a variety of golf related subjects from safety issues on golf courses to analysis of specification and other planning related issues.